Despite fine performances playing a bumbling burglar in Home Alone, his role as Leo Getz in Lethal Weapon 2, and gangster Tommy DeVito in Goodfellas (for which he won an Oscar®), this was the film that really put comic actor Joe Pesci on the map. Jonathan Lynn's (The Whole Nine Yards) My Cousin Vinny is a non stop fish-out-of-water comedy, also featuring Marisa Tomei (who won a best supporting actress Oscar® for her performance), Ralph Macchio (The Karate Kid) and Fred Gwynne (The Munsters). Bill Gambini (Ralph Macchio) and his friend Stan (Mitchell Whitfield) are on a driving trip through Alabama on their way to college when Bill inadvertently shoplifts a can of tuna at a roadside convenience store. After being pulled over by the police and confessing to the crime, the two yutes, umm...youths, are mistakenly arrested for murder, and Bill calls on his family for help. Fortunately, his cousin Vincent "Vinny" La Guardia Gambini the First (Pesci) is a lawyer. He makes the trip south from Brooklyn to defend his nephew, with his spike heeled, leather-and-spandex-clad girlfriend, Mona Lisa Vito (Tomei) in tow. Unfortunately, having only just passed the bar—after six failed attempts—cousin Vinny has never seen the inside of a courtroom, let alone argued a case. With the lives of his nephew and friend in the balance, he has to take on the Alabama judiciary while learning the rules of the game, under the scrutiny of Judge Chamberlain Haller (Fred Gwynne). His missteps cause friction with this unforgiving southern judge, his clients and his girlfriend. Long on ambition, but short on courtroom etiquette, Vinny tries not to blow his first case, lose his girlfriend or sentence his clients to death. Even when Stan decides to hire a public defender (Austin Pendleton, who makes a memorable opening statement), Vinny's tenacious attitude and stickling details will get him through it somehow...we hope. With only the courtoom sequences shot on soundstages, the remainder was filmed on location in Georgia. Lynn's direction is impeccable, with solid performances from the entire cast. The editing is tight, and the comedic content is original and well-paced, playing on Pesci and Tomei's Brooklyn accents for a fair amount of the humor. The prison sequence (shot in a real Georgia penitentiary) and Tomei's speeches about deer hunting and her biological clock are must sees. This is comedic fare at its finest, which is limited in audience only by the language, unsuitable for younger viewers. Interestingly, during production, a second version was shot with the actors modifying their language for a TV cut of the film. All in all this is a near perfect comedy, and a must have film. Image Transfer Review: Fox has delivered My Cousin Vinny in its original 1.85:1 aspect ratio, enhanced for 16 x 9 TVs. The image is flawless aside from a few very minor compression artifacts. Not much to complain about here. Audio Transfer Review: Audio is presented in Dolby Surround, and is also very high calibre. A French Dolby Surround track is also available, but somehow Pesci just doesn't sound right in French. Extras Review: Accompanying the feature is a commentary track by director Jonathan Lynn. While he breaks for important scenes, the track is full of interesting anecdotes about the production, and he points out many cases of foreshadowing that might be missed by the casual viewer. There is enough detail to keep things moving along, and the pauses are well placed allowing the viewer to recap the film and not miss any of the best sequences. Two 30-second TV spots and a pair of theatrical trailers round out the supplements. English subtitles are available. This is must have comedy for mature audiences. 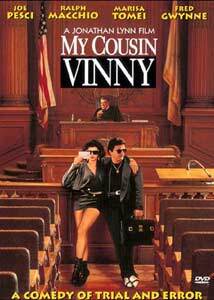 The script is brilliant, and Pesci's comedic showcase, paired with Tomei's brilliant performance make this non stop courtroom fun. Y'all grab some grits and set down to the funniest courtroom drama this side of Brooklyn.